So, what did you buy with all the money you saved? During our previous observing session together—we learned that the night sky doesn’t charge an admission—as long as you know where to look. There are bizarre stars just waiting to be seen and many of them don’t require fancy glass! Just those squishy optics inside of your face. When you look up into the night sky, what do you see? No, no, I’m not talking about stars…well…kind of…sort of. What I mean to say is: I’m not talking about specific stars. There. That’s better. Humanity has been seeing grand stellar patterns in the night sky since…forever. Cultures alllllll over the world gave their two cents and forged mighty mythologies, which we still read about, until this very day. The night sky is filled with stories, myths, and legends—detailing the origins of hypnotic stellar patterns, commonly known as—constellations. What’s the first constellation you learned? 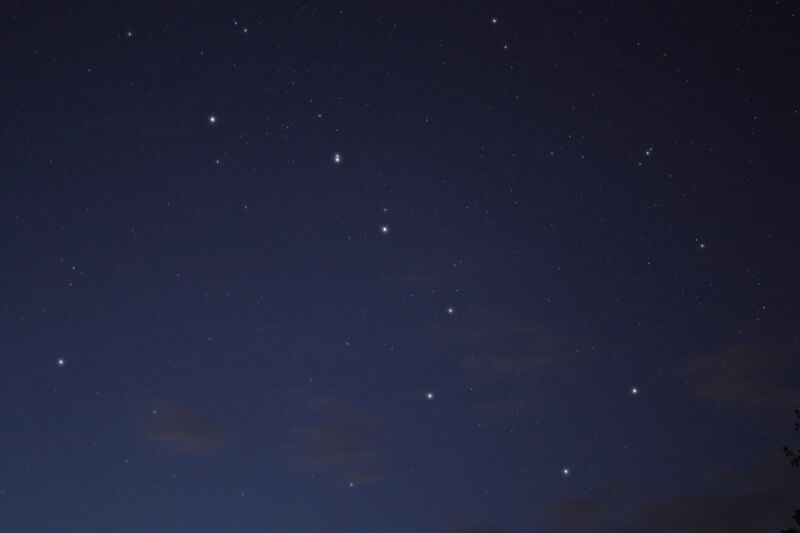 Wait!…don’t tell me…if I think real hard…I…can…was it…The Big Dipper? The Big Dipper is a very popular constellation! 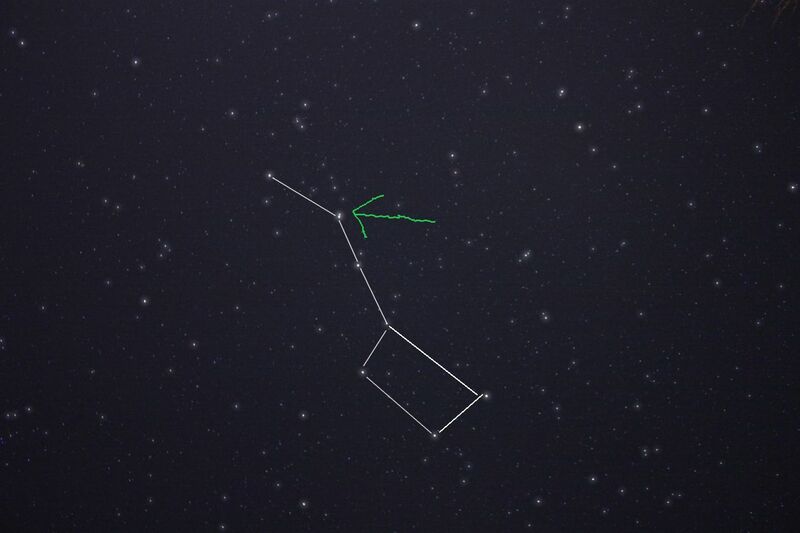 There’s just one itsy-bitsy problem: The Big Dipper is not a legit constellation! I know, I know, calm down. We go our whole damn lives thinking one thing, then we learn how stupid we truly are. Welcome to life, kiddo. Everyone will stand slack jawed because of your sheer brilliance. Learning the constellations comes with many benefits. Everyone smarter than me says so and guess what? It’s true! And guess what? Learning the constellations is absolutely free! 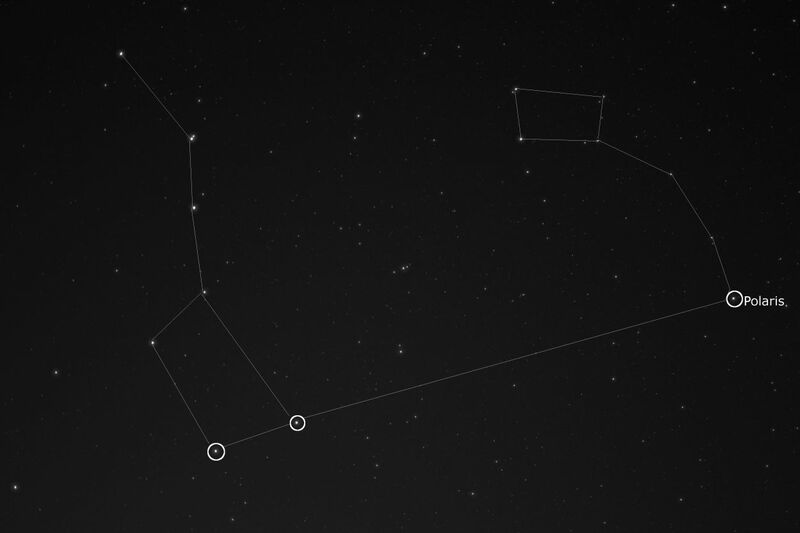 Here’s the secret to learning the constellations—time. That’s it! That’s all it takes. Oh! And dedication. Can’t forget that. Let’s be realistic: you won’t learn it all in one night, so don’t even try! Learn a little at a time. Start with what you know and branch off into new sections of the night sky, when you’re ready. The stellar patterns will eventually burn into your brain. Trust me. You’ll be able to close your eyes and see the constellations glowing behind your eyelids. Once you start becoming familiar with the night sky, you’ll start to notice stellar alignments, which point the way toward other sections of the night sky. The last two stars in the Big Dipper’s handle points the way to Polaris (North Star), which resides in the Little Dipper (another asterisk). Very convenient. 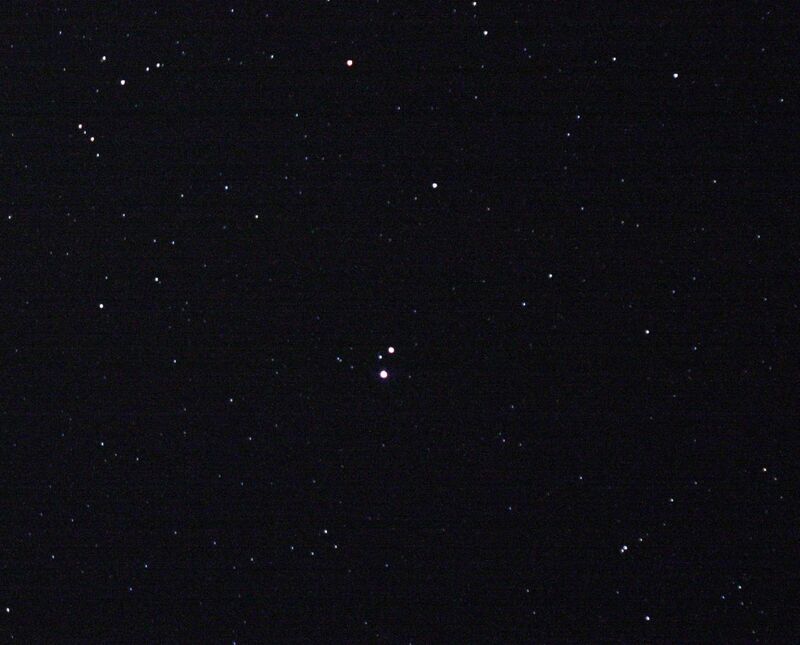 Excuse me, but can you help locate Mizar and Alcor? They are a popular double-star system. The ancients used this system as a primitive eye test—those that could ‘split the double’—were deemed to have excellent vision. You know exactly where to find this double-star system, right? Wow! There it is! 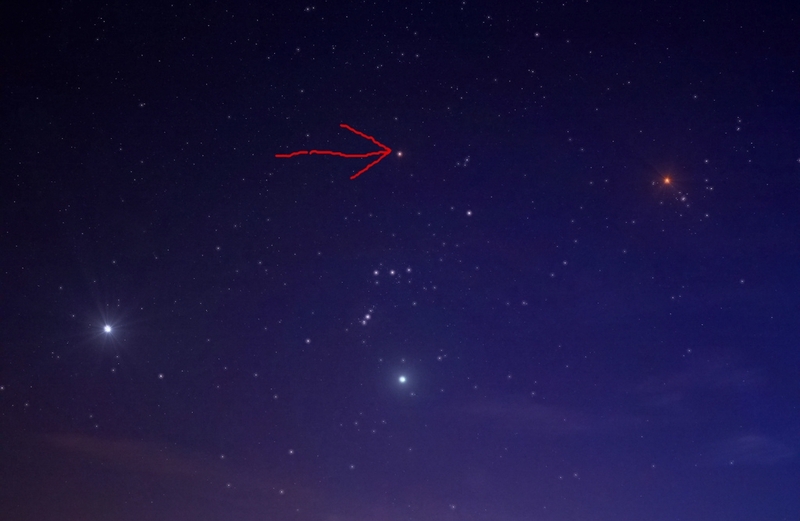 There’s Mizar and Alcor! Right smack in the middle of the frame. Gorgeous. I knew you could do it! Wait…hold on…do you know what just happened? You used a constellation (sort of) to locate specific stars! See what I mean? We have come full circle: not only can you locate lonesome bright stars, but you can now locate constellations, which helps locate…more stars. Congratulations! Pat yourself on the back! Kiss your reflection! You deserve it. Let’s tighten up this circle, shall we? Remember Betelgeuse? Great, because you’re going to use that star and locate the constellation Orion. Wow! You’re a fast learner! Betelgeuse marks Orion’s left shoulder. See? You used a star and located a whole damn constellation. Simple. Easy. You can do this blindfolded. Oh, I’m sorry, are trees blocking your way? No problem! 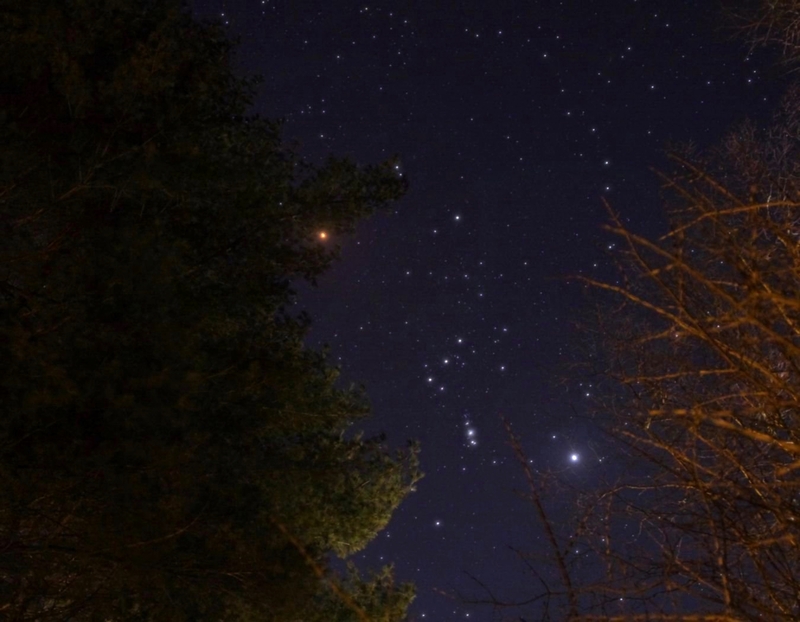 The tangerine glow of Betelgeuse burns through the branches and signals where to look. There’s no stopping you. Nothing can get in your way. The stellar lighthouses are a beacon for night sky adventurers. You are now one of those adventurers. **Remember** Constellations are seasonal and don’t worry about learning it all at once. The celestial characters of ancient lore are going no where…for now. Your piggy bank must be about to bust apart! We learned how to locate specific stars and constellations and didn’t need to spend a single dollar, peso, euro, rupee, yen, shekel, won, denar, or kina! That’s what I like to call—savings. Great blog😊❤️ keep it up! Thanks! Sorry for the late response! Your comment was mysteriously delivered into my spam folder, which doesn’t usually happen…I don’t know why it did that. Haha — Classic beginner mistake! I think those particular stars would lead you near Corona Borealis! Maybe that’s why those kids never got home that night… Oh well, they should have known better than to trust me!